Now that Warner Bros. is working to re-instill faith in its upcoming Green Lantern movie, new (way better) costume designs have been released. 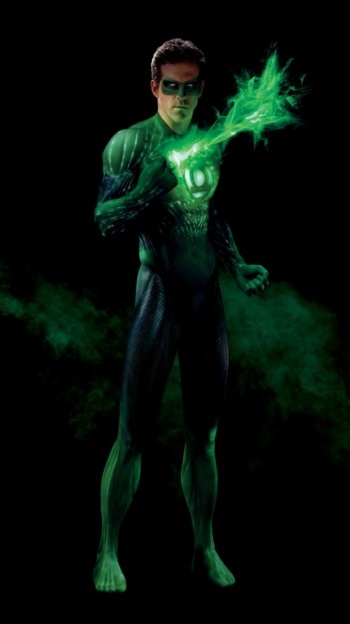 Up until recently, people weren't exactly enthusiastic about this summer's Green Lantern thanks to the costume concept art and a trailer that were released before they should have been. The first step towards recovery was to admit that this was a mistake, which Warner Bros. did. Then, the movie studio released some new, better, footage at WonderCon. Now, there are some new photos of what Ryan Reynolds is going to look like when he appears in the Green Lantern uniform; these, too, look a lot better than what was first released to the public. The uniform looks like it's much more faithful to the comics than what was originally on display last July. While it still contains the slightly-organic look, it's also a lot better than what was initially featured in the original movie trailer. There are some added details to the costume, including better color combinations and individual toes (which, honestly, seem a little awkward, but not terrible). Green Lantern is due out on June 7, in both 2D and 3D. After a rocky start, it seems as though Warner Bros. is getting back onto the right track with this movie. However, what do you think of the costume? Is it close enough to the original to feel like a match? Or does it still need more work?